Stress melts away around the dogs at the Woodruff Library’s Pet Therapy Study Break, set for Thursday, Dec. 13 this year. Photo by Emory Libraries. 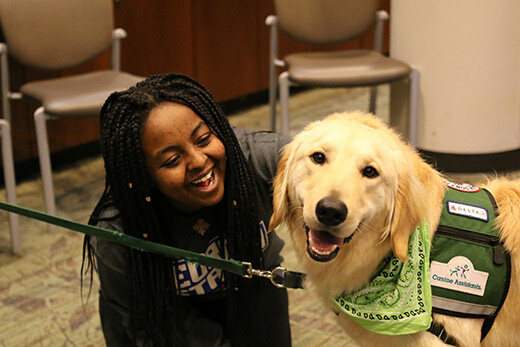 Finals can put a damper on students’ spirits, but Emory Libraries will help counter that with its annual Pet Therapy Study Break, which will take place 11:30 a.m. to 5 p.m. on Thursday, Dec. 13, in the Jones Room at Woodruff Library. Students can sign up to spend a few minutes with one of three dogs (a fourth dog will be available for walk-ins). Almost 400 students attended this event last year, so students are strongly encouraged to register in advance. Canine Assistants, which trains service dogs, and Pet Partners, which trains therapy dogs, will bring the pups to the study break. In addition, Emory Counseling and Psychological Services (CAPS) will bring Finn, one of its therapy dogs, to the study break session. The Native American Indian dog, a breed with hair (instead of fur) that can be more tolerable for people with allergies, is available through CAPS to help Emory students manage stress and anxiety throughout the year. “Spending a short amount of time just sitting and petting the dog was really comforting to me,” adds Kristina Jespersen, a senior majoring in film studies. “I have dogs and it reminded me of being at home.” Jespersen recalls that the dogs were charmingly content. “Our dog was falling asleep as we petted her and it was sweet and funny to see how relaxed she was compared to us,” she says. In addition, pet therapy can help students feel closer to home.